Each of us needs guidance for life's challenges, and there's no better place to look for help than God's Word. Bible Answers for Every Need offers inspiring selections from Scripture organized by topic so you can find the right passage to address your concerns. With an attractive imitation leather binding, presentation page and ribbon marker this volume makes a perfect gift for personal or ministry use. 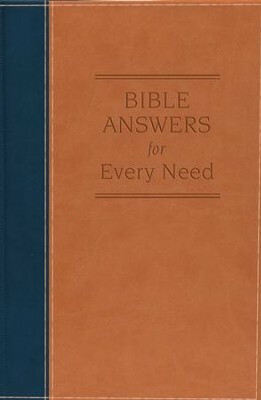 Experience the popular Bible Answers for Every Need, now available in this brand-new, deluxe four-color edition. When you need God’s perspective on an issue, turn to the topically arranged scriptures in Bible Answers for Every Need. With hundreds of Bible verses in dozens of categories, this book is sure to give you the insights you need. Clarence Blasier is writer from North Canton, Ohio. He has done extensive work with Scripture and how it fits into your everyday life. Scripture is translated into a more meaningful, practical form. Clarence Blasier also compiled The Golden Treasury Of Bible Wisdom. His books are: Bible Answers For Every Need, God's Encouraging Word, May I Share Something With You Someone Once Shared With Me?, What To Believe And Why. I'm the author/artist and I want to review Bible Answers for Every Need - eBook.